I have been trying to get my head around how to set up the file systems and stuff so you can start altering plugins - my goal is to edit how shield projectors work - at the moment I am trying to create a custom shield generator block and go from there.. Creating the block using the modding section of FtD is easy enough but all the plugin stuff is difficult to follow. If anyone has any advice or tips that would be great. 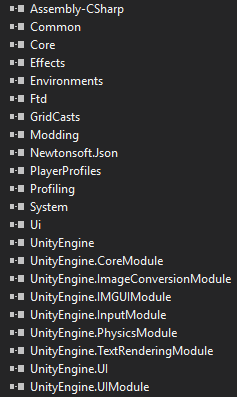 You shouldn't use .NET Core with Unity. Create a .NET Framework 4.6 Library project instead. Here is some useful dll references. (2019-01-25, 12:46 AM)Why7090 Wrote: You shouldn't use .NET Core with Unity. Create a .NET Framework 4.6 Library project instead. I run a virtual pc so would it be easier to do it all on there?